Call it whatever you like, but this is a fascinating subject. 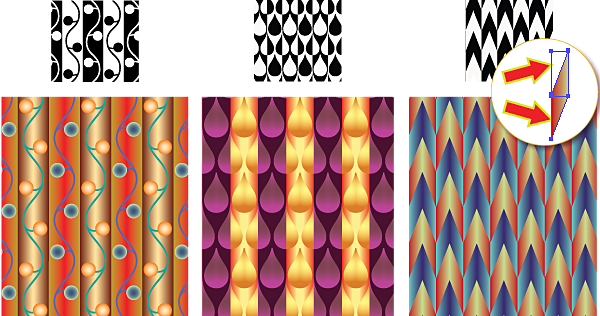 The terms “positive-negative patterns,” “patterns with figure-ground reversal,” and “counterchange patterns” are often synonymous, but they can also shed light on the same pattern at different angles and go to the heart of what makes patterns with color reversals so interesting and attractive. Before we start, let’s be clear on one thing. Traditionally, counterchange patterns are introduced with the help of black and white pictures, which is certainly proper because nothing conveys the gist of color inversion better; or the concept of yin and yang; or positive and negative. We’ll follow the tradition and give only a few examples in full color, mainly to drive home the fact that color reversals work splendidly with any number of colors so your counterchange color palette can be as elaborate as you wish. Back to the subject, “counterchange” usually refers to color reversals in the most generic sense. For instance, we could say that the number of standard pattern types grows dramatically from 17 to 46 if one permits color reversals, alongside rotations, reflections, and other symmetry operations, when generating a pattern from a motif. In that context the neutral term “counterchange patterns” is ideal. And, yes, starting from version 6, SymmetryWorks creates both the standard 17 pattern types and the 46 counterchange pattern types at a click. Three of the 46 black and white counterchange patterns from H.J. Woods re-created and recolored with SymmetryWorks. Inset: How do you make that chevron pattern? Draw a colored rhomboid, choose Mirror as the main symmetry and Mirror and glide as the color symmetry, and click Make in the SymmetryWorks panel. Then rotate the control path 90 degrees and tweak it to be as shown. Want to see a tutorial? Vote in comments.